The 2009 AIDS Epidemic Update released by the UNAIDS and World Health Organization (WHO) provides important information on the state of the global epidemic. The report also provides hopeful signs regarding advances made in the fight against AIDS. According to the 2009 AIDS Update, 60 million people worldwide have been infected with HIV and 25 million people have died of AIDS since the first cases in the early 1980s. By the end of 2008, 33.4 million individuals were living with HIV/AIDS. In 2008 alone, 2.7 million people contracted HIV and 2 million people died of AIDS-related illnesses. In 2008, 2.1 million children under 15 were living with AIDS, including 430,000 children born with HIV in the same year. Young adults around the world remain at high risk, accounting for 40 percent of all new adult infections. For every two individuals on AIDS treatment, five others became infected with HIV. Africa continues to be the epicenter of the global epidemic. The continent is home to 67 percent of all individuals living with HIV/AIDS, 91 percent of all new infections among children and 72 percent of all global deaths from AIDS. Women in Africa account for 60 percent of individuals living with HIV/AIDS in the continent. Africa is home to 14 million AIDS orphans. Nine of the top 10 countries with individuals living with AIDS are in southern Africa. The 2009 AIDS report provides glimpses of successful intervention strategies. HIV infections fell by 17 percent between 2000 and 2008 as a result of stronger political leadership, sustained international financial commitment and the mobilization of the civil society. UNAIDS is cautiously optimistic that the rate of new HIV infections is stabilizing in three countries in Southern Africa (Malawi, Zambia and South Africa) and also in West Africa. The much-feared uncontrollable epidemic in South East Asia, Russia and the former Soviet states has not materialized due to strong response by health authorities and stakeholders. By the end of 2008, 44 percent of adults and children in need of AIDS treatment were on antiretroviral therapy, compared to only 2 percent in 2003. Rapid uptake of AIDS treatment occurred in countries with massive health system challenges, decimated health workforce and endemic poverty. As a result of better access to AIDS treatment, fewer individuals are dying. Between 1996 and 2008, the UNAIDS estimates that nearly 3 million individuals may have been saved from untimely AIDS-related deaths. In addition, maternal transmission of HIV is now receiving better attention. As a result of improved access to antiretroviral prophylaxis by pregnant women, the UNAIDS estimates that 200,000 newborns may have been spared HIV infection between 2001 and 2008 worldwide. Rates of voluntary HIV testing and counseling of pregnant women are on the rise, and pediatric AIDS formulations for children are now more widely available. The fight against AIDS appears to be moving slowly towards community-based responses with the appointment of a former community organizer, Michel Sidibe, as the head of UNAIDS in December 2008. Within the last year, the UNAIDS and its partners have emphasized contextual issues that shape the progression of the global AIDS epidemic. They have also brought heightened attention on the multiple non-health issues such as human rights violations and gender inequities that facilitate HIV transmission. 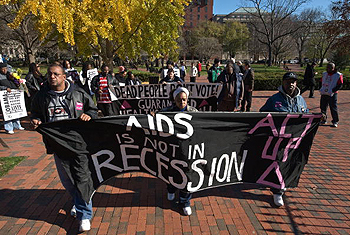 The first concern is whether financial assistance for AIDS programs worldwide will remain robust in the coming years. The UNAIDS estimates that $25 billion is needed to successfully implement AIDS programs in 2010, up from $15.6 billion in 2008. The ongoing global financial crisis raises significant doubts regarding the availability of additional financial outlays for global AIDS programs in the next few years. The financial crisis is already having an impact on resource-poor countries as planned scale-up of proven programs remains on hold and expansive rollout of AIDS treatment programs remains on standby. The UNAIDS estimates that as much as 100 national AIDS programs may be at risk from potential reduction in international financial assistance within the next few years. The second concern is what to do regarding the 5 million clinically qualified individuals who do not have access to lifesaving AIDS medicine. There is no viable plan in the horizon to reach these millions of individuals before their health deteriorates. If the global financial crisis lingers, the inevitable squeeze on health and social services may cut off critical support lifelines for millions of individuals awaiting access to antiretroviral treatment programs. The moral hazard of watching millions of people die of AIDS despite the availability of lifesaving medicine will be incalculable. The third concern is the growing difficulty with designing and implementing viable HIV prevention programs. Reversing rates of HIV transmission is the only viable way to achieve long-term success against the AIDS global epidemic. It is now obvious that we cannot treat our way out of the global HIV/AIDS epidemic. The sorry state of HIV prevention programs is compounded by steady declines in funding for information, education and communication campaigns against HIV transmission. The inability to identify and properly target high-risk target populations in HIV prevention programs is another implementation headache. The fourth concern is the lackluster commitment and support for universal access to AIDS, tuberculosis and malaria services in resource-poor countries on or before the end of 2010. The universal access strategy, if successfully implemented, will accelerate the mainstreaming of HIV/AIDS programs into healthcare delivery mechanisms in target countries, thereby countering the growing criticism of the global attention on HIV/AIDS at the expense of other health problems. In addition, successful joint universal access programs on AIDS, TB and Malaria will help resource poor countries strengthen their health systems, beef up their health workforce and seamlessly integrate their health programs into national poverty reduction initiatives. Finally, the relative absence of the business sector in the fight against AIDS is troubling. Although businesses have been active on workplace HIV/AIDS issues and have financed high-profile HIV prevention campaigns, the global impact of the organized private sector in the global fight against AIDS is negligible. According to the UNAIDS, in 2008, regarding international AIDS assistance, bilateral programs accounted for 69 percent of the overall expenditure; the AIDS Global Fund, 17 percent; the U.N. system, 6 percent; foundations, 7 percent; and, the European Union, one percent. The global fight against AIDS requires significant, sustained support from the organized business sector. It would also require the formidable skills of the private sector on how to reach inaccessible populations, how to optimize services in resource poor environments, how to coordinate services, and how to understand the needs and concerns of target populations. The global fight against HIV/AIDS is slowing shaping up to be a major defining moment of our time. With millions at risk, the stakes are high. In 2009, it appears that we may be able to see the proverbial light at the end of the tunnel, but the fight requires the full complements of stakeholders around the world working side by side and the timely mobilization of needed resources to stop new HIV infections and to halt untimely deaths from AIDS.